Pastitsio is to Greek cuisine what Lasagna is to Italian cooking. This classic Greek recipe makes for an excellent winter comfort meal. Served with a side of mixed green salad dressed with wine vinegar and Greek extra virgin olive oil, this is one meal that is sure to please guests and family. A piece of Pastichio Perfection. Click to Enlarge Image. Now, I am not in the habit of watching much television, especially the daytime major American network programs. However, today, as I was feeding my son his bottle I happened to catch Rachel Ray making what she called “Greek Baked Ziti” which we Greeks know as Pastitsio [pronounced as pa-STEE-tsee-oh]. At best, it was amusing to watch her pretend to know what she was doing. Unfortunately, within a few minutes it became painfully obvious that she really did not have a clue; and when her frustration started to show, it was embarrassing to think that her audience would walk away with such a bastardized version of a classic Greek food recipe planted in their heads. So, in order to straighten Rachel out, I thought I would offer up my mother’s recipe for Pastitsio. I have been enjoying this dish as long as I can remember - it happens to be one of my all-time favourite Greek recipes. There are three components in the construction of this famous pasta casserole dish, and each must be attended to individually before combining them to achieve the final product. 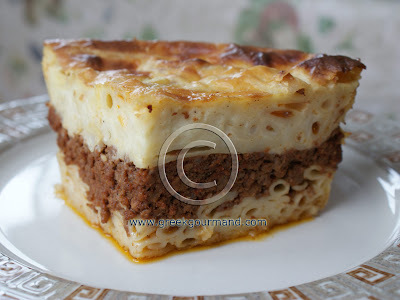 The first component is a ground meat sauce which is similar to one that Greeks often serve over macaroni as detailed in my previous post: Macaroni, Makaronia, Makaronada, and Pasta… Similar, but not the same; one does not add cinnamon or any other aromatic spice to the meat sauce for Pastitsio. Why? Because it is overkill! Only the top layer of Béchamel Sauce gets a hint of nutmeg which then permeates the casserole as it bakes. I have seen so-called Pastitsio recipes on some other blogs which mix cinnamon and allspice in with the meat sauce, and then they complete their muddle of flavours with the requisite nutmeg in the Béchamel sauce! Buctani: A thick Spaghetti style pasta which is hollow through the center, similar to a drinking straw. (Of the two Italian shapes listed here, this one is the closer approximation to the Greek No. 2 pasta size). Ziti: A larger diameter long-cut and smooth surface hollow (tubular) pasta shape. Though it is also possible to use Penne pasta for this dish (my mother-in-law often does) I prefer sticking as close as possible to the classic composition for the sake of authenticity and ease of assembly. Lastly, there is the Béchamel (i.e. White) Sauce that is poured overtop of the assembled casserole before it goes into the oven, and which forms a wonderful top layer and slight crust to the dish. 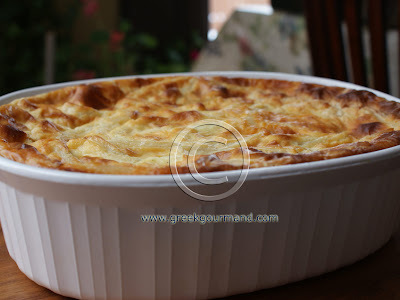 For another classic béchamel-topped Greek casserole dish see my Marvelous Moussaka recipe. My Pastitsio straight out of the oven. Click to Enlarge Image. I used a CorningWare 2.5-qt. Oval Casserole without the lid to bake my Pastitsio. The depth of this type of baking dish allows for a nice layered height in the finished product. As with many Greek recipes, and most especially with casseroles, this dish is best consumed on the following day after its baking; simply refrigerate and heat well before cutting and serving. Heat the olive oil in a large pan and sauté the diced onion(s) over a medium heat until soft. Add the ground veal to the pan and break it up thoroughly. Keep stirring constantly over a medium high heat for 5 minutes or so to brown all of the meat and mingle it completely with the onion. Spread the meat sauce overtop of the bottom pasta layer, ensuring to distribute it evenly and right to the edges of the casserole. The meat layer must be of uniform thickness and must not have any gaps. Add the remaining pasta overtop of the meat layer, distributing it evenly. There you have it, Pastitsio Perfection! 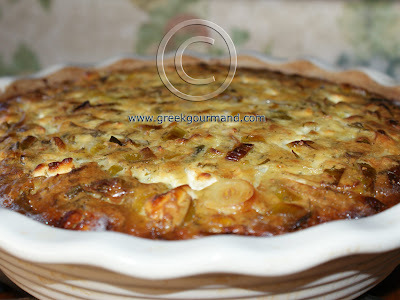 An easy to make and very tasty traditional leek pie recipe from North Western Greece. If you like leeks, you will love this pie. Straight from out of the oven. Click to Enlarge Image. Leeks are my favourite seasonal vegetable this time of year. They have been an ingredient and seasoning in Greek food since the earliest times. Among the ancient Delphians, leeks were included in ritual offerings to Leto (mother of Apollo and Artemis) during their Theoxenia or “Banquet of the Gods” festival. It was believed that Leto had craved leeks while pregnant with the twins, thus a contest was instituted in her honour in which only the largest leeks were selected to be added to the offerings table. The producer whose leek(s) won the contest would be rewarded with a portion from the collected offerings. Leeks as thick around as radishes and turnips were reported. Interestingly, there appears to have been some kind of relationship between divine twins and leeks. For, it was also related that the ancient Athenians included leeks in their customary offerings to the Dioscuri. 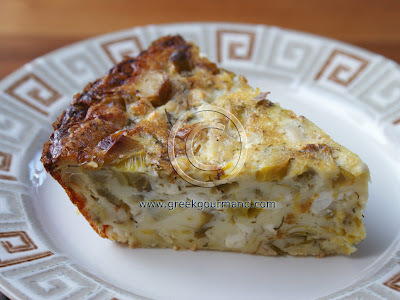 A slice of prasópita anyone? Click to Enlarge image. Today, Greek cuisine offers many variations on the use of leeks. They are included in everything from sausage stuffing to soups and stews, and are often baked into ‘pies’ or pites (pronounced “PEE-tess”) as we say in Greek. For those of you who do not relish the idea of making pites with phyllo pastry (cf. filo), this version will make your life easier, as well as add some excellent texture and flavour to your winter table. Heat the olive oil in a pan and sauté the leeks for about 5 minutes, then add the fresh green onion and continue sautéing until both are soft and tender (another 3 minutes or so). In a large bowl, beat the eggs well then add the milk, feta cheese, flour, dill, oregano, salt and pepper and sautéed leeks and onions and mix well. Grease the sides of your pie dish/pan with some olive oil, pour the mixture to the dish/pan then bake for about1 hour in an oven pre-heated to 350°F (180° C). Allow to cool before cutting. Can be served warm or at room temperature. Personally, I prefer serving this on the following day to allow the flavours time to meld. I usually refrigerate the pie once it has cooled to room temperature and then cut and warm the slices as need. When I was young, my sister and I would go to Danforth Avenue (Toronto's Greek town) on the morning of New Year's Eve and sing the "Kalanta" at the doorways of all the Greek owned businesses on the street. The shopkeepers would reward us with money and good wishes for a lucky and happy New Year. This custom goes back a couple millenia and is an outgrowth of ancient pagan celebrations at the beginning of each calendar month, signifying the start of the new moon cycle. Indeed, the name "Kalanta" is derived from the ancient Roman (Latin) word "Calends". Like many other pagan customs, the "Kalanta" were later subsumed within the Byzantine Christian traditions which replaced the old ways, and were transmitted right down to our present day as folk customs. On New Year's Day, wherever they may happen to live, Greeks come together with their families and friends for the traditional cutting of the Vasilopita (King's Cake). The event centres around the cake itself, for which there are a number of regional recipe variations ranging from a sweet bread, to a cake, to a phyllo-based pita-style version; though the traditional recipe was standardized by the Byzantine Emperor Justinian sometime in the 6th Century and is best characterized as a sweet bread, almost a cake. The ritual of cutting the Vasilopita has nothing to do with the edible constituent ingredients of the Vasilopita itself. Instead, the focus is on 1) the inedible ingredient, usually only one coin, and 2) the invisible ingredient: the love of family, friends, and community, which binds and brings together all those who take part in the Vasilopita tradition by accepting a piece of the cake when it is cut. First, the coin. The coin is called a 'flouri' [pronounced FLOO-REE, remember to roll the 'R']. The flouri is added to the dough and baked right into the Vasilopita, and upon its cutting, one of the recipients of its pieces will find the flouri in their portion. The fortunate soul who so finds the coin is then hailed as the "luckiest" individual for the next 364 days by the gathered company. Now, historically speaking, the baking of coins into breads and cakes which were holy offerings for holiday occasions was not invented by Saint Basil (also known as "Basil the Great") who purportedly lends his name to the Vasilopita -the "Vasil" part. In point of fact, the ancient pre-Christian Greeks and Romans were both familiar with this peculiar patisserie practice and many of their festivals included such tokens and the name likely refers to "Vasil" as 'King' which is the original meaning of the word itself. Seventeen centuries ago, Basil was appointed as Christian bishop (in Greek, a 'despot') of a place called Caesarea that is the modern-day city of Kayseri in Turkey. He was a contemporary of the Emperor Julian, who was known as 'the Apostate' for his impracticable mission to resurrect a dying paganism in the Roman Empire. When said Emperor went forth on an ultimately unsuccessful mission to conquer the Sassanid Empire (a persistent revival element of the ancient Persian Empire), his army made his way through the vicinity of Caesarea on their way to Mesopotamia. As wars require financing, he put a special emphasis on squeezing the local provincials with extra tax demands; and he took a special interest in Christian communities. Basil's regard and care for the poor and underprivileged of Caesarea was legendary and a universally respected trait, one which earned him the devotion and love of his followers, Christian and non-Christian alike. In addition to numerous other works, Basil had commisioned a structure known as the 'Basiliad', a large complex on the outskirts of Caesarea, which included a shelter for the poor along with a hospital. The man himself was renowned for his charity and personal poverty, yet he spared no expense when it came to the care and succour of others, and his ability to provide for their needs drew the attention of Julian's overzealous tax-collectors. So, Bishop Basil was was 'invited' to help fund the Emperor Julian's war effort. Having eschewed personal wealth in providing for his fellows, Basil turned to his followers and friends to raise the money. His followers gave up whatever they could afford to ensure that nothing happened to their beloved bishop and a tidy sum was assembled posthaste. The Emperor Julian was unsuccessful in his bid to reduce the Sassanid capital of Ctesiphon and he was reportedly killed by one of his own men during a skirmish with enemy forces while his army was withdrawing back to the safety of Roman borders. There is speculation that Julian's death was an assassination ordered by Basil, but there is no direct evidence to support such a claim. Suffice it to say, once the Emperor was dead, Basil was no longer under severe constraint to provide money to the failed war effort. This in turn, left him in a quandary as nobody had kept records of who had donated what amount to the sum which had been collected in his name, and he now desired to return the money to his community. Thus, according to the tradition, he fixed on the idea of having equal shares of the money baked into small loaves which he then distributed among them, one for each family. When the loaves were cut, each family discovered a fair share of the total amount that had been originally amassed. It is said that to honour their bishop, his followers continued and passed on the practice of a yearly Vasilopita complete with a lucky coin, and the practice is still perpetuated almost 1700 years later. In this tradition, no mention is made of the original pagan practice of the King's Cake, where a bean was baked into the cake. This is hardly surprising as many pagan, pre-Christian practices were subsumed within Christianity over the course of its history. Suffice it to say, this custom of the King's Cake is as old as the hills of Rome and will likely continue for ages to come. Happy New Year!